The reasons for changes in the brightness of a star can be divided into two categories: (1) orbiting companions or (2) stellar astrophysics. (1) In principle, the variability from orbiting companions (this includes eclipsing binaries or transiting planets) should be as regular as clockwork. In practice, the variability can deviate from clockwork regularity if stellar binaries get too close together, if there are multiple transiting planets, if there is additional background electronic noise or astrophysical noise. (2) Brightness variations caused by physical processes internal to the star (stellar astrophysics) can arise from pulsations of the star, starspots or flares. 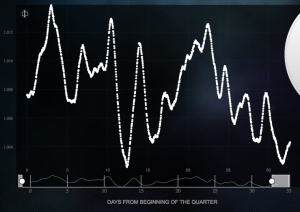 Flares are random spikes in the light curve brightness. 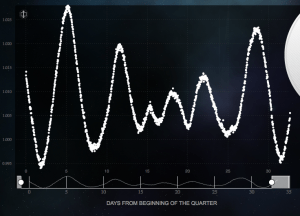 Pulsations from stars (like RR Lyraes) are quasi-periodic: they can appear to be regular for a while and the cycles are relatively short (generally hours to a day or so). The Figure below shows two variable stars with short periods that might be best classified as “variable” and “pulsating.” These could be short period binary systems – this could quickly be verified with follow-up observations. Starspots produce complex variations. As the star spins, the spots rotate in and out of view with a periodicity of a day or two (for the most rapidly spinning stars) to several days for slowly rotating stars (the Sun has a rotation period of 25 days). Starspots can form at different latitudes on the star. Since some latitudes rotate faster, spots can show multi-cyclical variations. The light curves below might be best classified as variable and irregular. However, a case could be made for classifying the light curve in the figure below (and left) as variable and regular. Even though the amplitude of the curves changes, the time from one peak to the next is about the same. Thanks very much for your help with this project. At last count, roughly 50,000 light curves had been sorted at planethunters.org. Many of you have requested more examples about how to classify stellar variability, so we’ll start with the easiest case. All of the light curves below are examples of quiet stars. Random variations in brightness occur because of photon noise (similar to shot noise in electronics). The number of photons that are collected are small enough that there random fluctuations that have nothing to do with the actual brightness of the star. Photon noise (or Poisson noise) produces scatter, but the data remain in a nearly featureless band of points. If you look closely at the light curve data for these quiet stars, you will see light gray error bars associated with each data point. In any physical measurement, the error bar simply captures our ignorance about the true value of the measurement. 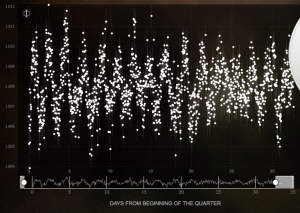 In the Kepler light curves, the brightness is represented as a discrete dot, however, any and all points along an error bar are equally correct values for that particular brightness measurement. 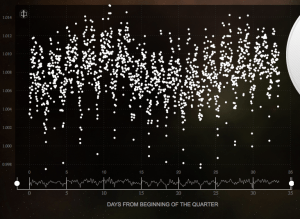 In the quiet light curves above, should any of those low points be flagged as possible transits? Probably not. A deviant point or two can still just be noise. A true transit event should have a series of low brightness points that last for the time it takes the planet to cross in front of its stars (i.e., a few to several hours, represented by a few to several data points). Low dips that repeat are also good indicators of a transit, however some of the most exciting transits (from planets in wider, more habitable orbits) will only occur once per month (for example, a true analog of our Earth would just transit once per year). The quiet light curves above may seem like duds, but they are an extremely important aspect of research for this project. Stars that do not vary in brightness are particularly important objects for exoplanet searches with other techniques. The work that you’re doing will feed into our understanding for the next generation instruments and space missions that could be built to detect planets.